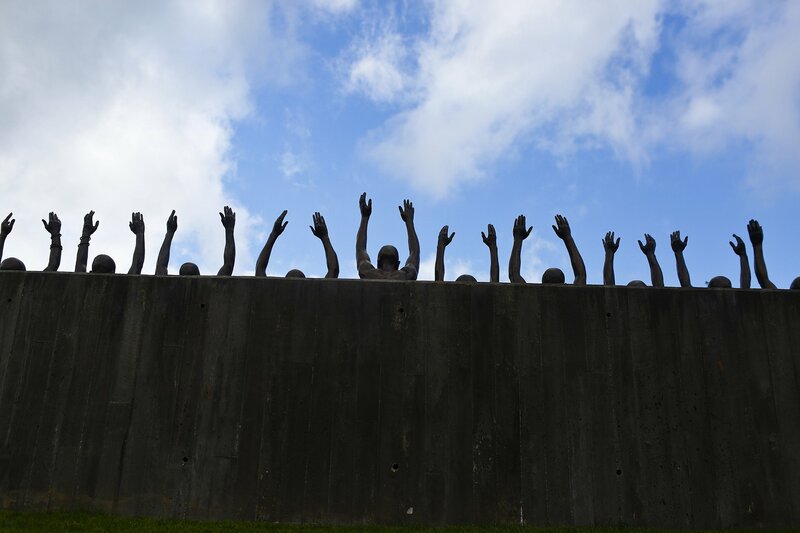 This photo shows a bronze statue called "Raise Up" as part of the display at the National Memorial for Peace and Justice, a new memorial to honor thousands of people killed in racist lynchings, April 23, 2018, in Montgomery, Ala.
Migrant caravan on the move in Mexico, lynching victims memorialized in the US, and more. The "caravan of migrants" that US President Donald Trump first decried two weeks ago recently arrived at the US border. Mostly women and children, the travelers are expected to ask for political asylum after fleeing violence and persecution in Central America. Violence and persecution is also on the minds of people who visit the National Memorial for Peace and Justice that opened this week in Montgomery, Alabama. The memorial seeks to honor the thousands of black men and women who were lynched throughout the US, a largely neglected part of American history. Along the border of Bangladesh and Myanmar lies an area hemmed by barbed wire known as “no man’s land.” Rohingya refugees gathered there earlier this week to protest the Myanmar's ongoing oppression of the ethnic minority. Indigenous communities in Brazil gathered to negotiate with their government and call for stronger land rights. French President Emmanuel Macron, meanwhile, visited Washington to urge the US Congress to take stronger action against climate change. Here are some of the best images from this week. 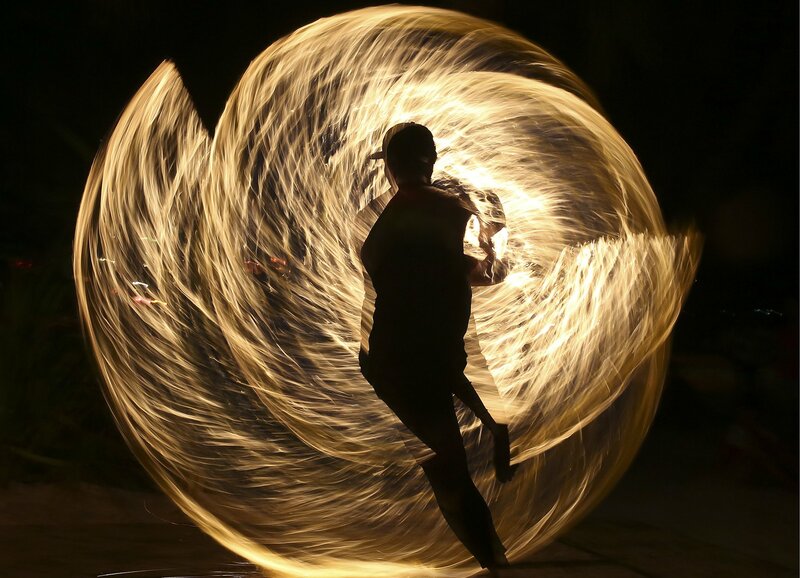 1) Boracay in the Philippines: A Filipino fire dancer performs for the last time a day before the government implements the temporary closure of the country's most famous beach resort island of Boracay, in central Aklan province, Philippines, on April 25. Its once-crystal-clear waters have been tainted by sewage and garbage, and in order to clean up what President Rodrigo Duterte has called a “cesspool,” the government announced on Wednesday that it would close the island for six months. Over the past few decades, Boracay has become a major tourist hotspot, leading to the rapid and unregulated development of the island’s tourism industry. With that development came a massive environmental problem. 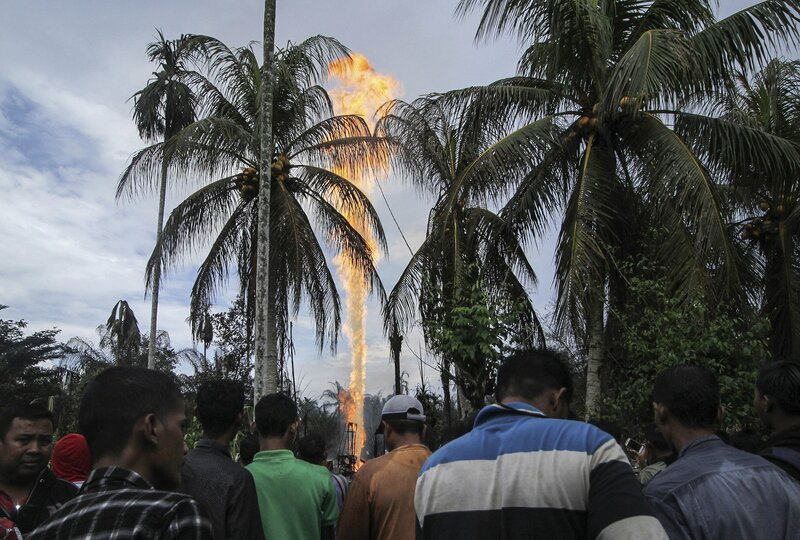 2) Oil Fire in Indonesia: Curious onlookers watch an oil well burns after it was caught fire in Pasir Putih village in eastern Aceh, Indonesia, Wednesday, April 25. The newly drilled, unregulated oil well in western Indonesia exploded into flames early Wednesday, burning to death a number of people and injuring dozens of others. AFP Photo 📷 Sai Aung Main - A fireman battles a huge fire at a massive garbage dump in Yangon on April 23, 2018 that has raged for hours blanketing a large part of the city under foul smelling smoke. 3) Fire in Myanmar: A fireman battles a huge fire at a massive garbage dump in Yangon on Tuesday, April 23, that has raged for hours blanketing a large part of the city under foul smelling smoke. 4) Central American Immigration: Honduran immigrants rest at a shelter while on their journey to the US-Mexico border on April 22 in Hermosillo, Mexico. Some 600 immigrants, part of a caravan of mostly Central Americans that began almost a month ago, is within days of reaching the border. Traveling together, many atop freight trains known as the "beast," they have sought safety in numbers on the dangerous journey. Along the way, they have received an outpouring of help from local charities, the Mexican Red Cross, private citizens and government officials. President Donald Trump sent National Guard troops to border regions in response to the caravan, although many in the group are families who plan to seek political asylum the US. AFP Photo 📷 @yeaungthu - Rohingya refugees gather in the "no man's land" behind Myanmar's boder lined with barb wire fences in Maungdaw district, Rakhine state bounded by Bangladesh on April 25, 2018. Myanmar government said on April 15, it repatriated on April 14 the first family of Rohingya out of some 700,000 refugees who have fled a brutal military campaign, a move slammed by a rights group as a PR stunt ignoring UN warnings that a safe return is not yet possible. 5) Rohingya Refugees: Rohingya refugees gather in the "no man's land" behind Myanmar's border lined with barb wire fences in Maungdaw district, Rakhine state, by Bangladesh on Wednesday, April 25. Myanmar government said it had repatriated the first family of Rohingya out of some 700,000 refugees who have fled a brutal military campaign, a move slammed by a rights group as a PR stunt ignoring UN warnings that a safe return is not yet possible. 6) National Memorial for Peace and Justice in United States: This photo shows a bronze statue called "Raise Up" as part of the display at the National Memorial for Peace and Justice, a new memorial to honor thousands of people killed in racist lynchings in Montgomery, Ala. The national memorial, just opened this week, aims to teach about America's past in hope of promoting understanding and healing. 7) Taekwondo in South Korea: Taekwondo practitioners perform in a demonstration outside South Korea's National Assembly building in Seoul on April 21. The event, which involved some 10,000 participants including children, was aimed at celebrating the designation of taekwondo as the country's state-sponsored martial art by the National Assembly. The event is expected to set a new Guinness world record. AFP Photo 📷 @olivier.morin - This aerial picture shows a canoe laying on ice, near holes made by fishermen, on the melting frozen sea, in spite of warm temperatures at the beginning of spring, on April 23, in Bjoerkoe, Raipaluoto island, western Finland. 8) Fishermen in Finland: This aerial picture shows a canoe laying on ice, near holes made by fishermen, on the melting frozen sea, in spite of warm temperatures at the beginning of spring, on April 23, in Bjoerkoe, Raipaluoto island, western Finland. 9) Bolivia Daily Life: A woman walks along Pereferica Avenue, past a street stall of popcorn, known as "pipocas," backdropped by the snow-capped Illimani Mountain, at sunset in La Paz, Bolivia, April 24. Illimani is part of the Cordillera Real in the Andes of South America. 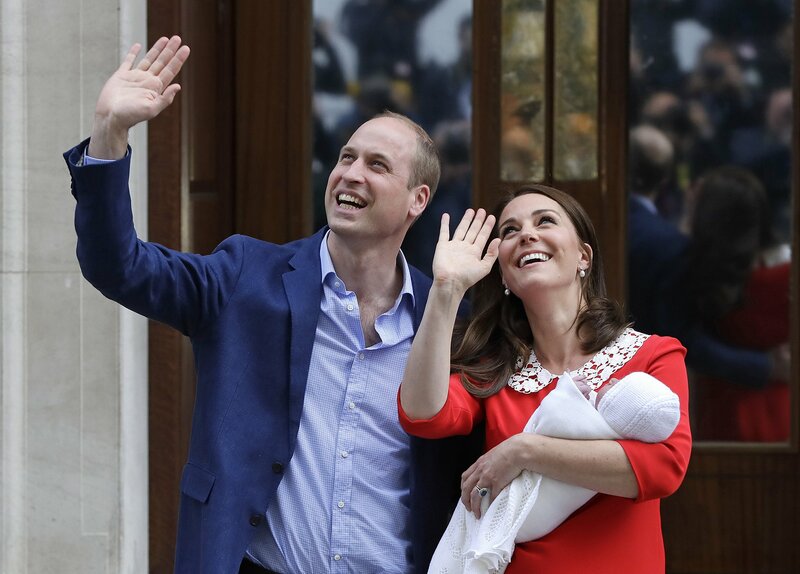 10) Royal Baby: Britain's Prince William and Kate, Duchess of Cambridge wave holding their newborn baby son as they leave the Lindo wing at St Mary's Hospital in London London, April 23. The Duchess of Cambridge gave birth Monday to a healthy baby boy, named Louis Arthur Charles — a third child for Kate and Prince William and fifth in line to the British throne. 11) South Africa Protests: South African workers march as they embark on a nationwide protest against a proposed minimum wage in Cape Town, South Africa on April 25. The South African Federation of Trade Unions (SAFTU) organised the protest march and called on workers across the country to stay away from work to join the nationwide strike against the proposed national minimum wage and amendments to labor law. 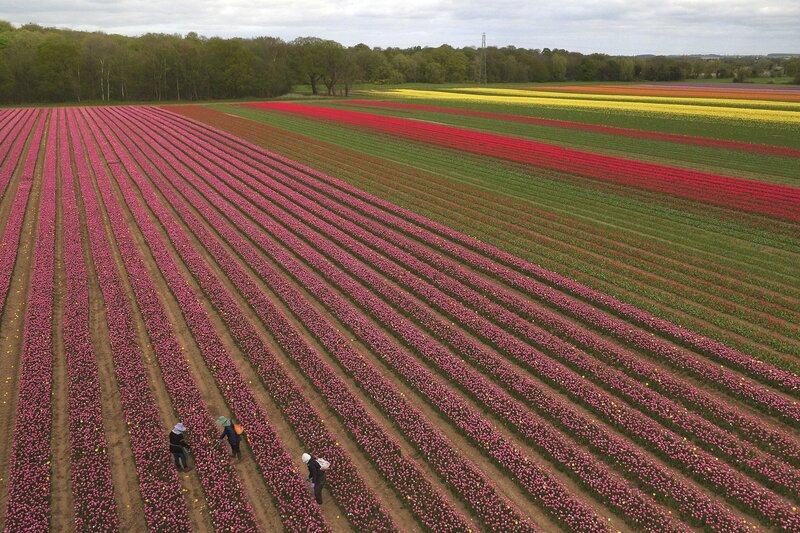 12) Daily Life in Britain: A view of a field of tulips in bloom is pictured near the village of East Winch, Kings Lynn in Norfolk, England on April 23. 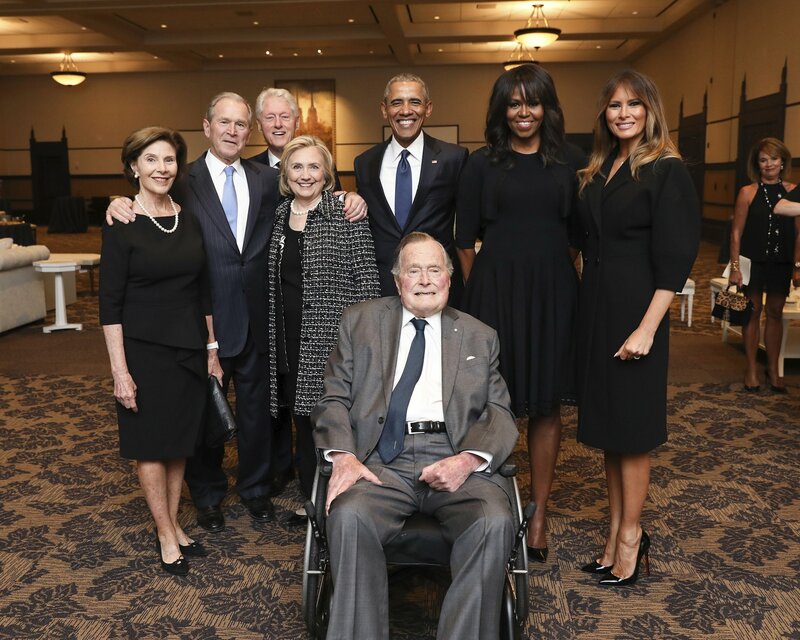 13) Former Presidents and Family Honor Barbara Bush: This photo, provided by the Office of former U.S. President George H.W. Bush, shows Bush, front center, and past presidents and first ladies Laura Bush, from left, George W. Bush, Bill Clinton, Hillary Clinton, Barack Obama, Michelle Obama, and current first lady Melania Trump in a group photo at the funeral service for former first lady Barbara Bush, in Houston on April 21. Barbara Bush died April 17. She was 92. 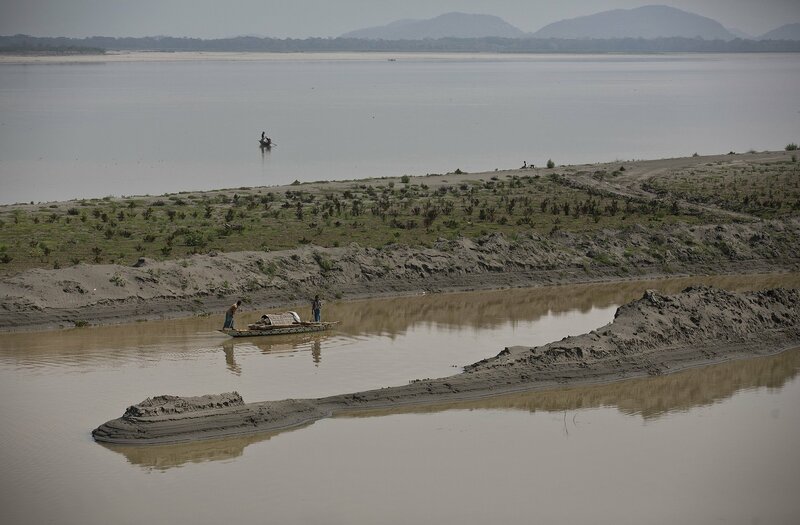 14) Fishermen in India on Earth Day: Indian fishermen row boats past siltation in River Brahmaputra in Gauhati, India, April 22. April 22 is observed as Earth Day every year as a tool to raise ecological awareness. 15) Brazil Indigenous Rights: Brazilian indigenous men perform a ritual dance during a protest against the government's decision not to recognize the land demarcation of indigenous people living in Raposa Serra do Sol, Roraima State, in Brasilia, on April 25. About 2,500 indigenous people from different tribes are taking part in the Indigenous National Mobilization week, a mobilization which seeks to tackle territorial rights' negotiations with the government. 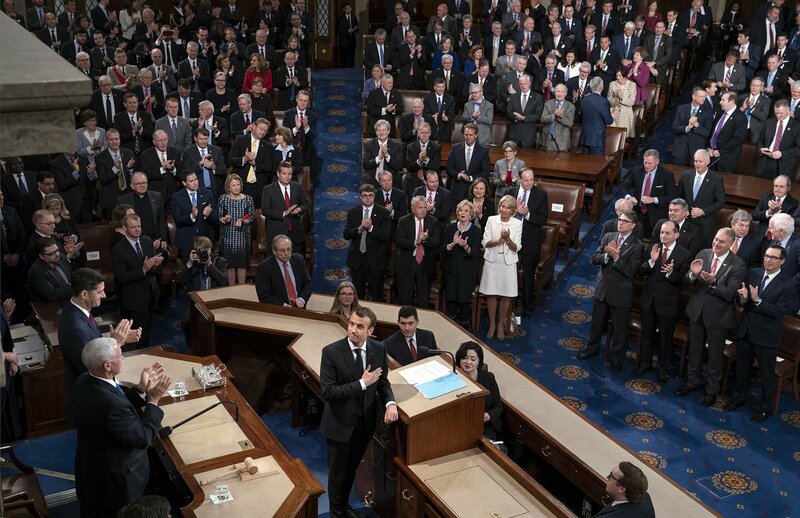 16) President Macron in the United States: French President Emmanuel Macron touches his hand to his heart as he finishes his address to a joint meeting of Congress with Vice President Mike Pence and House Speaker Paul Ryan applauding at left, at the Capitol in Washington, DC, April 25.